(first posted 6/3/2012. 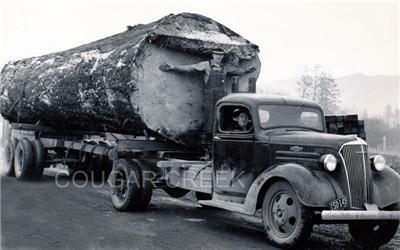 Updated with info about this truck’s working history at bottom of article) After a long week of felling giant trees with axes and those new-fangled smoky chain saws, Oregon’s hard-working loggers need them some hearty entertainment. 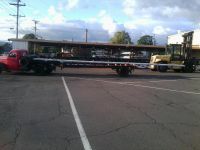 So they unhook the semi trailer after dropping the last load at the mill, hop in their suddenly spry-feeling International truck, and head to Main Street in Cottage Grove, to The Axe and the Fiddle, where there’s a traveling burlesque review booked. After manhandling logs all week, these guys need to see something to remind them of the softer and more feminine aspect of life. And while the guys are inside enjoying themselves, this 1937 International is also feeling the pleasure of getting its load off its fifth wheel. Now you might think this pint-sized International might be a bit petite for such hard work, but back in those days, men and their trucks were built of sterner stuff. 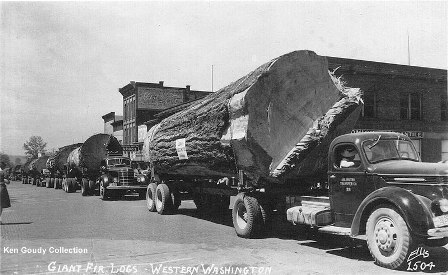 The logs were bigger, the men were tougher, and the trucks were smaller. 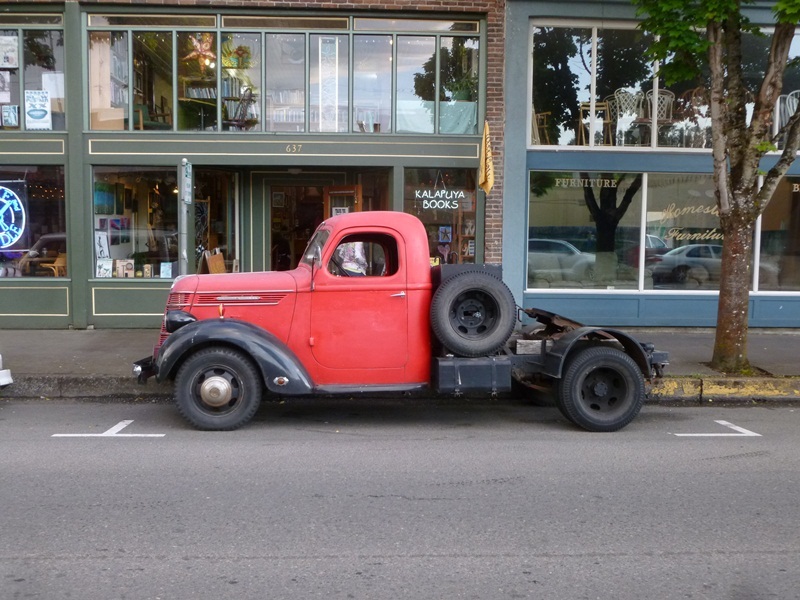 Today, young guys drive around in jacked up giant diesel pickups twice the size of this little ’37 Chevy. But their loads are empty; all show and no go. Not these guys. Yes, we can only imagine what it was like, felling trees this size with axes, hand saws and the like. And then hauling them to the mill with such modest-sized trucks. Hardworking rigs indeed. These trucks are maybe a size or two bigger than our featured hauler, but here’s an old Ford about the same size. I take it back; it has somewhat bigger wheels too. This pint-sized demi-semi cornbinder has all of 16″ wheels, and the tires look like they haven’t been changed since the Korean War. But here it is, sitting one door down from The Axe and Fiddle on a Friday night. Well, the hardworking loggers need a little entertainment after a hard week of felling giant logs with their axes. And who better to entertain them than Trudy Bauchery and her Burlesque Review? Why do you think we were in Cottage Grove on a Friday night? To look at books? Not that night. When you’ve been in the woods for a solid week or three, the thought of a good-old burlesque show has some genuine appeal. And thankfully, it’s still in style, or has become so again, in the retro-hip North West. So headliner Trudy Bauchery, along with Angelique DeVil, Babs Jamboree, Dada Ne Nada, and Dandy Pie find receptive audiences up and down the Willamette River Valley. Now, Sophie Maltease was not part of this Review, but she does have a video giving those of you in the Bible Belt an idea of how we debauched West Coasters spend our Friday nights. It ain’t at prayer meeting. 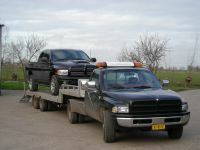 Nowadays, a pickup-sized truck is used either for show, maybe for hauling sissy fifth-wheel recreational trailers. 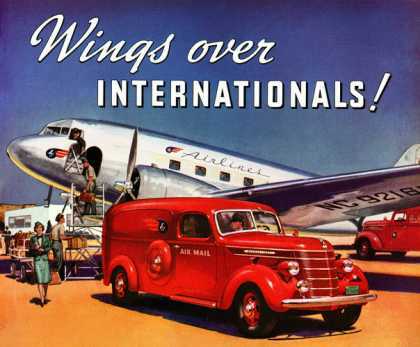 Turns out, the 1937 International actually has a colorful history with that too, as well as logs. 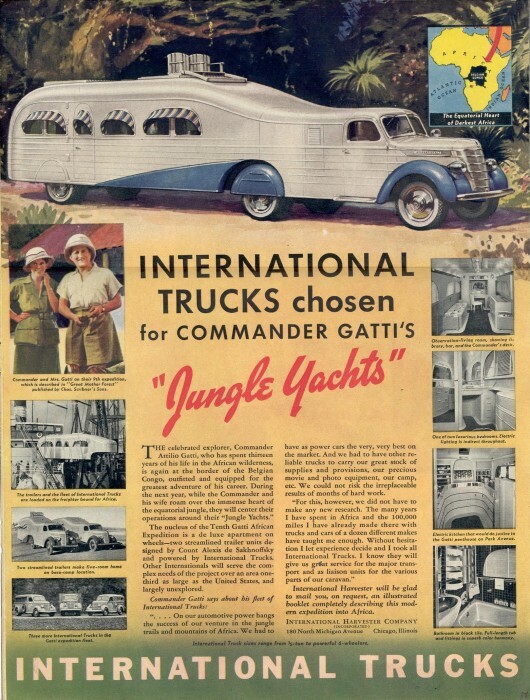 “Commander” Gatti’s famous “Jungle Yachts” were hauled by 1937 Internationals. Designed by Count Alexis de Sakhnoffsky, these colorful and luxurious rigs were ahead of their times. 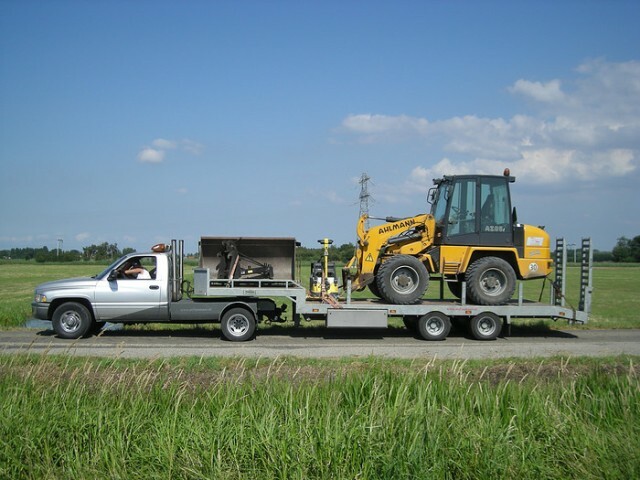 But there’s little chance that our featured truck spent its life hauling anything like that. This is the deep woods of Oregon, a Heart of Darkness of a very different sort than Gatti was exploring. I can see why deSakhnoff was drawn to the International; for 1937, it was a very handsome truck indeed. Actually, this could be any model year up through 1940, as they didn’t change them. But 1937 has a nice ring. 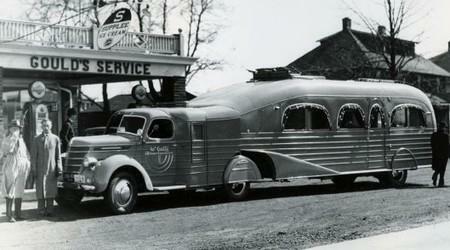 These were smartly styled indeed; Streamlined Moderne finally arrived in the tough and tumble truck world. And under the sleek hoods beat the durable OHV sixes that International became famous for; in trucks as well as tractors (well, fours mainly, in the tractors). And a smartly designed cab and dashboard too. 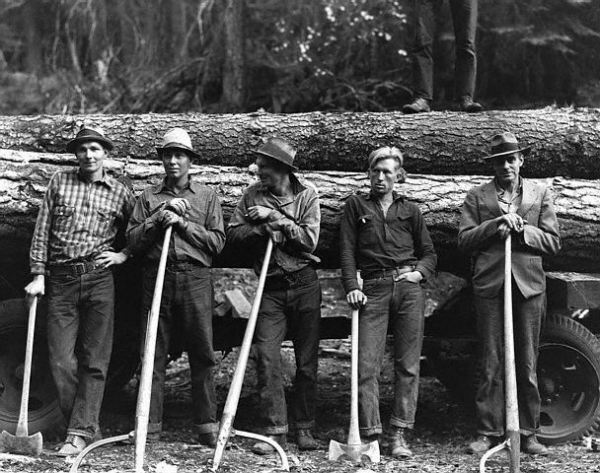 A bit cozy for three, but a little bromance among loggers was inevitable. Lest anyone doubt that this is a genuine work truck, and not some effete poseur, here’s the business end. Fruehauf! That name rolls off the tongue, like the millions of trailers hooked to it (and also made by the same company). Makes sense. Needs a bit of grease though, guys. Maybe after the show; first things first. Update: The owner of this truck found it here at CC in 2014, and added the detailed history of it. 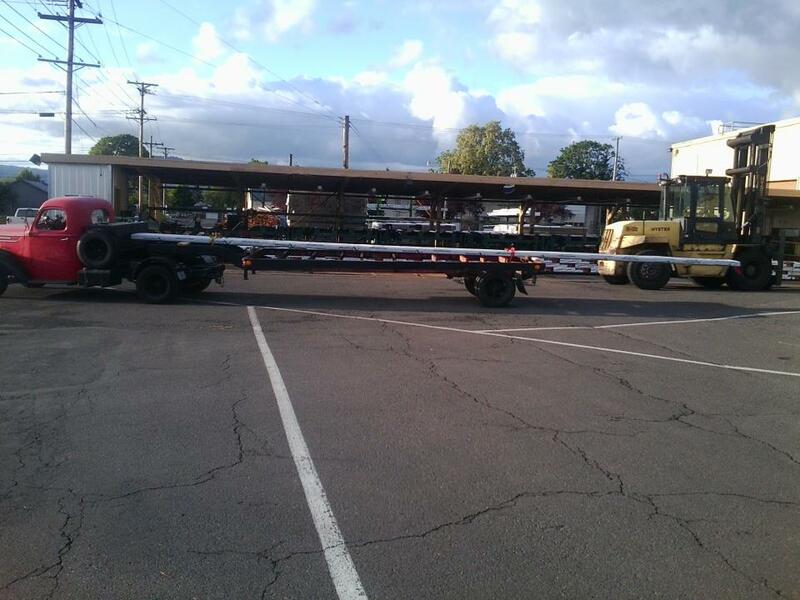 Turns out it wasn’t a log hauler exactly, but it did haul a freight trailer all over the West. And it’s still hauling today. 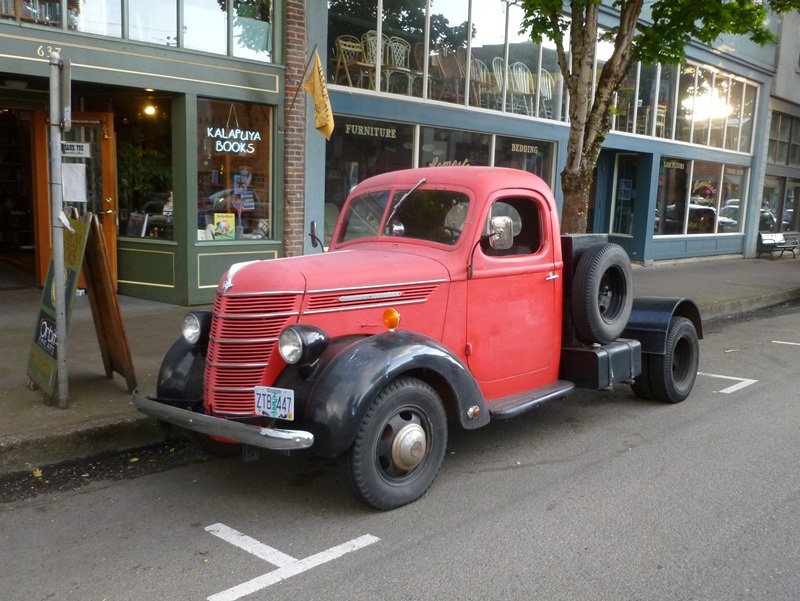 John Barrong writes: This is my truck! 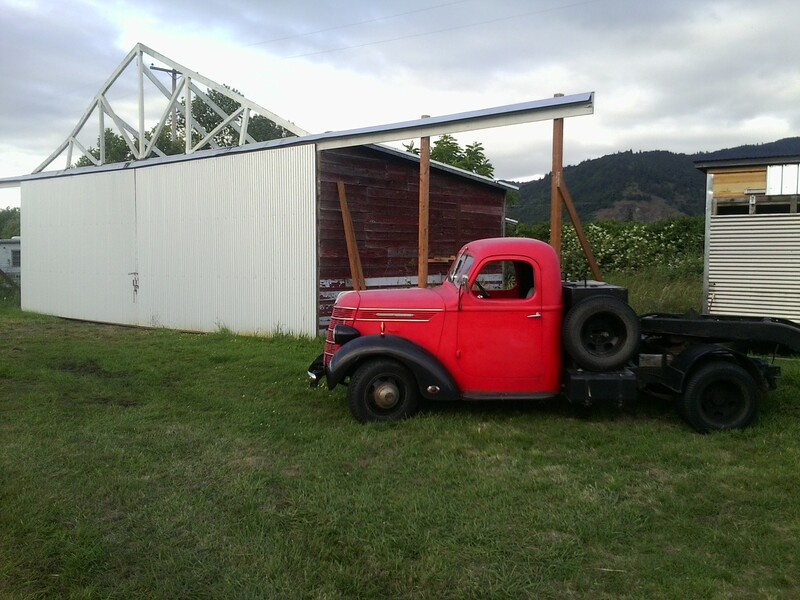 and it is a workhorse it is a 1938 d15 had the six removed in 1967 and replaced with 1957 Chevy 283 V8 and 4 speed with 3 speed brownie, and I have its original matching freight truck trailer. I have log books that show this truck hauling from Montana to Santa Fe, with repairs in Durango, Pagosa Springs as far south as Arizona. 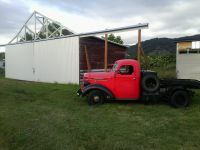 It spent most of its life hauling sheep in Eastern Oregon; now it hauls antique steam and gas engines and glue lam beams from the mill I work at for friends I bought this truck for $3k four years ago, and it is continually being restored as it is used. From the looks of that plate and particularly the way it is mounted I’m doubting that truck has seen a trailer on it in a long time if ever. 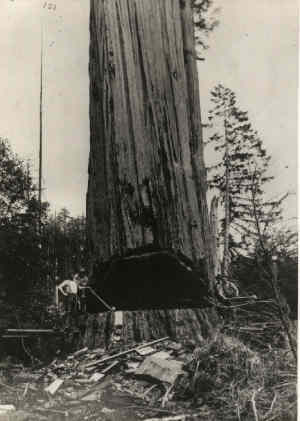 My Grandfather logged all over the Northwest and in the redwoods. He told me about having his brakes fail down grade on a logging truck several times. I wondered how that could happen with Westinghouse air brakes, but now I realize they were probably hydraulic like this one. A true classic you found right there. I see some of the pictures and read the accounts of what was done with the equipment back in the day and I’m in awe of what my grandparents and great grandparents generation did. Loading 60-100k lbs of logs onto what we’d call a 1 & 1/2 ton today, with small drum brakes. Of course compared to getting the logs out via Steam Donkey and Logging railroad a gas powered truck was the bees knees. 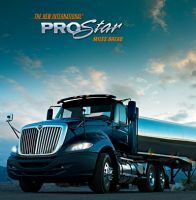 Interestingly when International designed the current ProStar tractor they put in a lot of their 30-50s design language. The Lone star is even more retro, and was heavily influenced by the D-series trucks. Thats a sweet truck it looks to be enjoying retirement most trucks from that era got worked to death hauling loads in excess of their design. Photos from New Zealand Kauri felling days show logs split in quarters being pulled by two trucks chained in tandem there wernt any weight limits in the bush only lack of available hp. Inters had a good name as log trucks here though weak axles on R190s kinda let them down we still have Navistars about I spent quite a while in a 9000 tractor unit hauling general freight nice truck though well worn with 850,000kms clocked up when I left it. Just a plug for Oregon’s Collier Park, on US 97, a bit north of Chiloquin (all told, about 25 miles north of Klamath Falls), where the state has a pretty good logging museum. On Father’s Day, they do a Living History exhibit where the old (kinda old ranging to incredibly old) iron gets a workout. We have 2-3 steam engines running (I ran the 10HP Westinghouse last year, but I’m recovering from cataract surgery), as well as a diesel powered saw mill. Lots of chainsaw and power-stroke saw stuff running, too. The museum is open much of the year, but the equipment only gets out to play twice–once for the Father’s day stuff, and sometime in May for boiler checks. The gas engines might get workouts in the September Logger’s breakfast fundraiser, but I’m not sure. Yes, a nice find. But that little International That Could, is doing no more – that fifth wheel tells me it’s seen naught but washing and waxing for many a season. Not putting it down, as a find or as a valued member of the automotive community – but it’s become someone’s status symbol and showpiece. Makes sense, when you think about it: If your status derives from big and flashy cars, you get yourself a big and expensive classic as a showpiece. But, if you draw the ooohs from your WORK equipment…then a proven, classic fifth-wheeler is just the thing to hit the town with on a Saturday night. this aint no status symbol its my old workhorse trailer hauler! 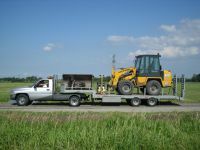 hauling lam beams to walker airfield for a hanger rebuild job! fits right in with the 1929 fleet biplane that lives here! The passenger license plates are another clue that this old ‘Binder isn’t hauling much these days. 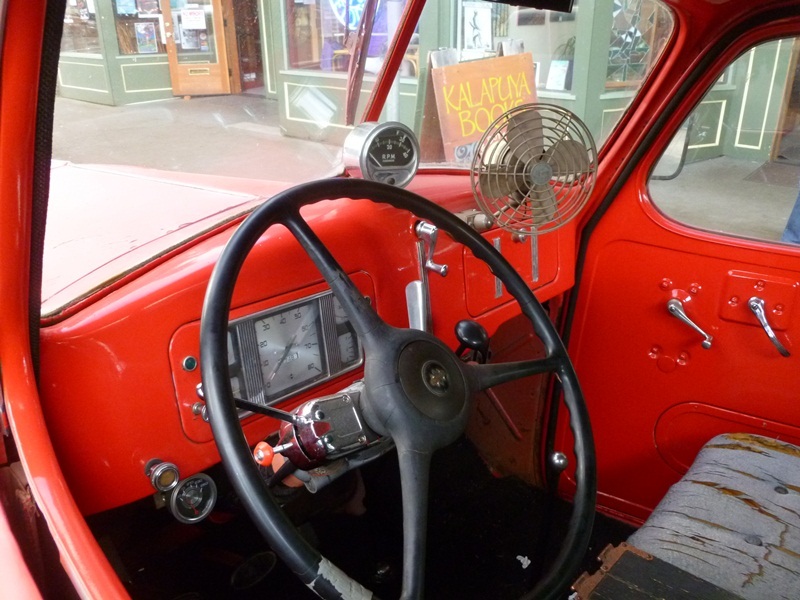 My, that little truck brings back memories of my father’s old 1949 KB-11-F – in spite of being a decade newer, the cab was exactly the same, including the instrument panel. The floor was different though, as it had two winch control levers and an auxiliary transmission shift lever in addition to that for the main transmission. That was also a considerably bigger truck than the loggers shown above. This truck looks mid 40’s but it sure reminds me of the 1940 half ton I had. Gave it to my nephew who, I hope, is putting it back on the road. Even the same faded red color. Belonged to my brother who broke a rear axle just before he died. 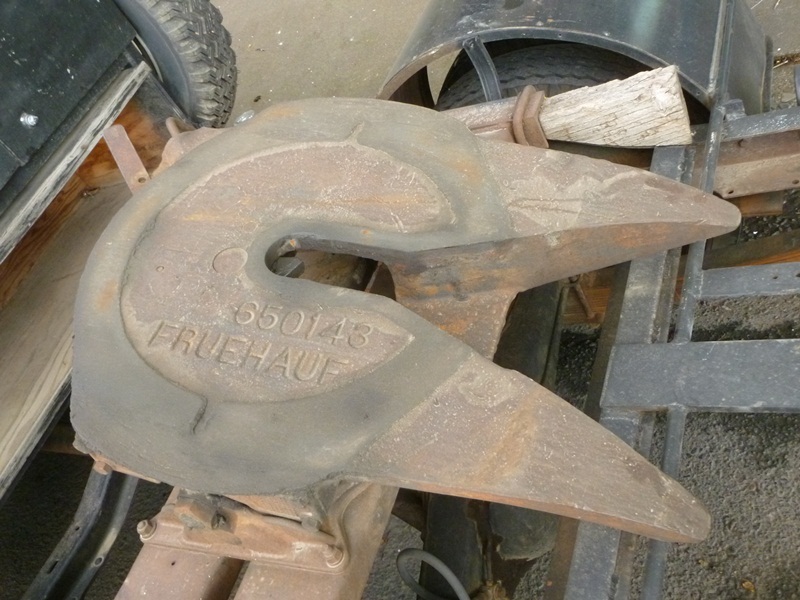 I was just thinking about Fruehauf — used to be that 99% of the trailers one would see in the 79s 80s were stamped w/ this name. then all of a sudden it wasn’t the case and now it’s impossible to see one in the wild. Anyone know if they’ve gone belly up? Defunct 1997. Wabash-National bought their assets out of bankruptcy. Their last trailers would be about fifteen years old now…end of their service life. I was pulling Fruehauf Btrains last month old and rebuilt several times no doubt. Jumped online after my question and noticed the Wabash takeover. wow, Fruehauf nearly had a monopoly on trailers back to the mid 70s and really crashed hard — that’s fascinating. 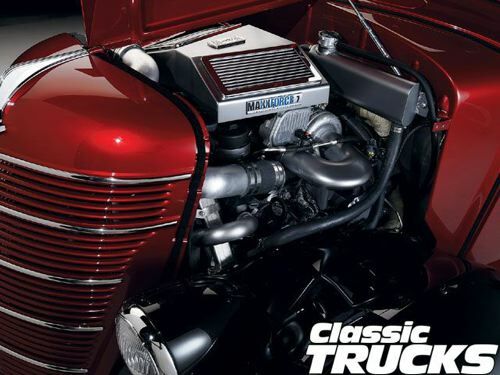 As part of the build up for the intro of the Lonestar pictured above Navistar had the Dmaxx built a 1939 D-series with the Maxforce 7 also sold as the 6.4L Powerstroke. How bout the fact that most burlesque dancers are “real” looking women who don’t appear to have been starving themselves and usually haven’t had “work done.” That’s much of the appeal. The truck on the other hand reminded me of a guy my Dad worked with who took a small “demi”-semi (as you aptly put it Paul) and dropped a flat bed on it and proceeded to use it as a farm truck. It was a unique rig. Very real indeed; one or two almost too much so. These are women from Portland, comfortable with their bodies, very self-aware, and having fun with this form of theatrical expression. And the audience is coming from the same place; a very fun night out indeed. was a great evening! thanks for taking such nice pictures of my truck! I used to hang out at my uncle’s hog market (Heinholds) in Buffalo Prairie, IL. The pig pen contracted with Murdock Trucking in Aledo, IL to pick up little piggies and the local farms. I would bum rides with the Murdock driver who was a real cowboy. 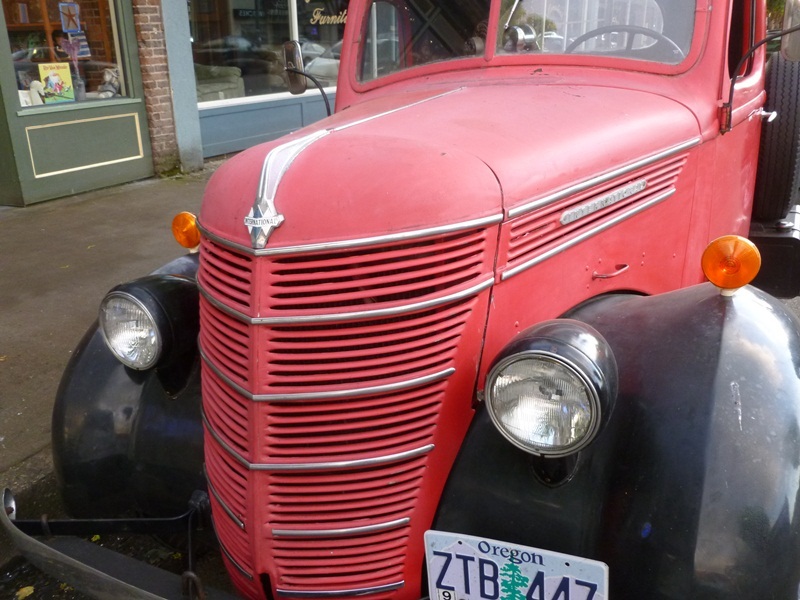 The truck was a ’46 or ’47 International with a 4-speed and a two-speed rear end. And the best part was that it had an exhaust cutout. That big six sounded sweet on the icy Illinois back roads at 80 mph. 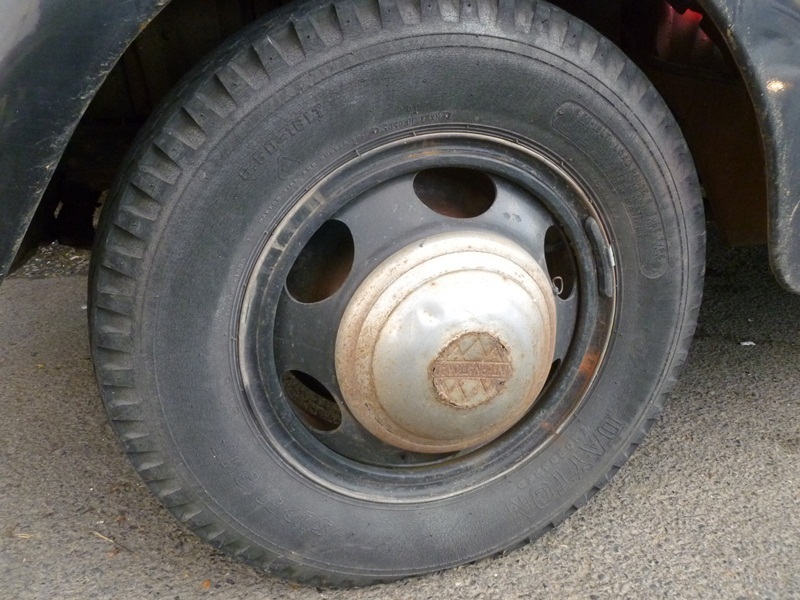 Murdock ran Michelin radials exclusively, sorta rare for the early ’60s. My other uncle, a Seiberling tire dealer, didn’t think much of that. This reading is so true. Every wanna be man has a jacked up 4×4 diesel that is always in the way. Most can’t drive them worth a crap and seem scared to death of their own trucks. I here em bragging and comparing the Dodge Cummins and Ford Powerstokes like they’re real trucking men. I haul my equipment, logs, and lumber for saw milling on a 1966 C60 Chevy. It has a 292 inline six cylinder engine, 4speed transmission, and 2speed rear. I’ve loaded it down with as many white oak logs as it has room to haul and take them to the mill. I sure am glad that my manhood isn’t so small that I gotta have $50,000 +$ truck to get a girl or feel that my set has dropped. this is my truck! 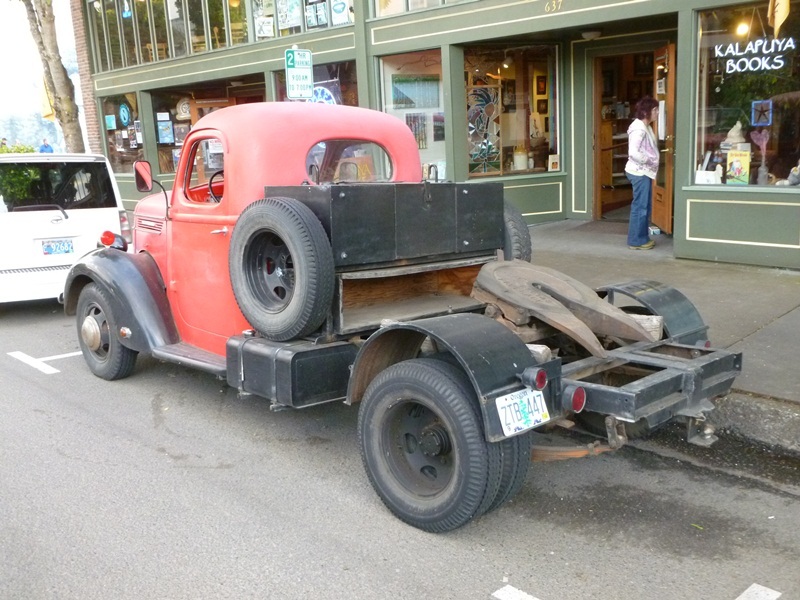 and it is a workhorse it is a 1938 d15 had the six removed in 1967 and replaced with 1957 chevy 283 and 4speed with 3 speed brownie and i has its original matching freight truck trailer. i have log books that show this truck hauling from montana to santafe, repairs in durango, pagosa springs as far south as arizona spent most of its life hauling sheep in eastern oregon, now it hauls antique steam and gas engines and lam beams from the mill i work at for friends I bought this truck for 3k 4 years ago and it is continually being restored as it is used. John, Glad you finally spotted this article. And thanks for the info on it. 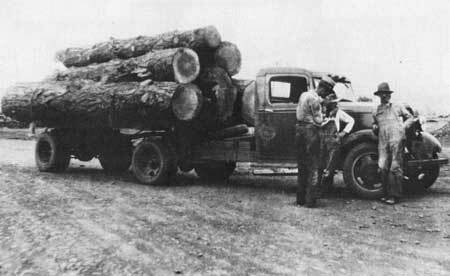 I took a stab at it having been a logging truck, but in any case, I knew it had been a hardworking truck in its day. Mighty fine truck you have. Thank you for telling us this truck’s story and I enjoyed reading the article again. Wow. What a great truck, and even better to hear that it still sees useful work! Every car has a story indeed. The 1937 International has the best looking front end appearance I’ve ever seen. 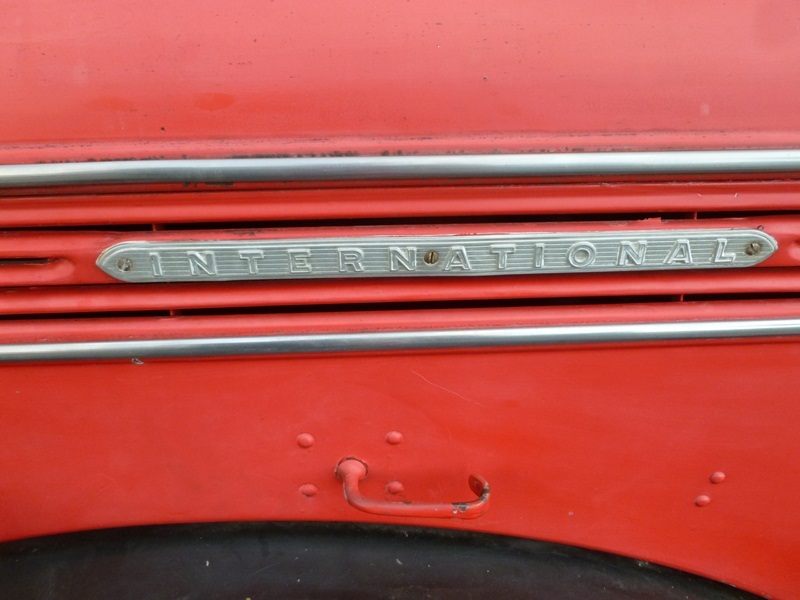 If I remember correctly, “Further” the bus used by Ken Kesey tour the USA in the 1960s was a 1937 International. 39 International Harvester, per wiki. Thanks for this re-run. Nice miniature tractor unit ! This kind of small tractors has become common in the past years, since you can drive them with a car + trailer driver’s license. The most popular tractor-units are the Mercedes Sprinter and the Iveco Daily. Both RWD, both with dual rear tires. Here’s a US Double-Dodge-combo. 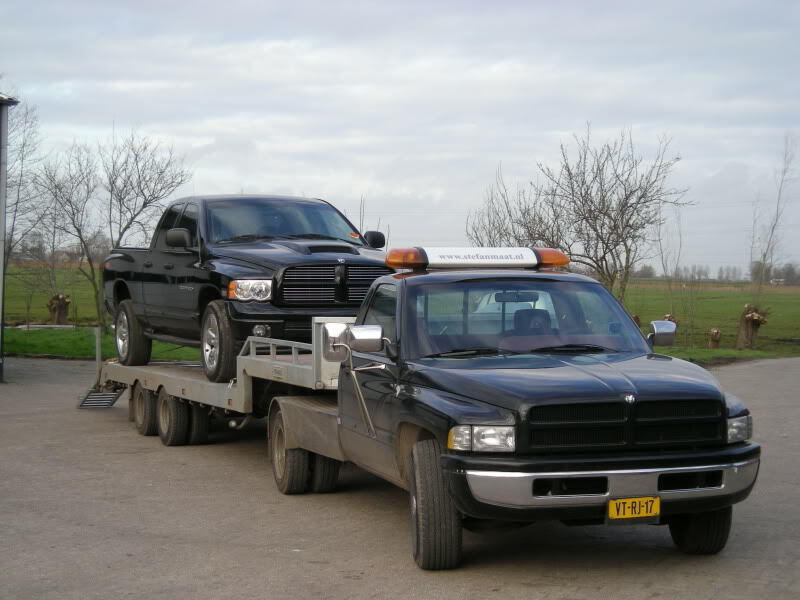 The tractor is a 1995 Dodge Ram 2500, its towing capacity is 9,000 kg (almost 20,000 lbs). Photo courtesy of Stefan Maat. Same Dodge, after a repaint job. I was about to say, “with the dual rear wheels, that’s actually a 3500.” But I see that the front axle is the SRW style, and there were no SRW 3500s until 2003. So it is actually a 2500–it’s just got a rear axle DRW conversion. Neat. Yep, I checked its official registration, it’s a 2500 alright. Six-cylinder diesel (Cummins, I assume ? ), 5 speed manual transmission. Definitely a Cummins. The gas options were the 5.9L Magnum V8 and the 8.0(! )L Magnum V10. The International Cub 4 cylinder tractor engine was rather popular for use in boats, small craft like sailboats. I have rebuilt a couple of them. They are the only engine I have seen, with cast iron pistons, with my own eyes. But I do know it was common practice in early days of internal (and sometimes external 🙂 ) combustion engines. I am interested in the Green 1976 Plymouth Valiant brougham. I have been looking for three days and could not find any info about the car. In Bradenton Florida 34203 name George Zeiler,i wiil await your response thank you George Zeiler .